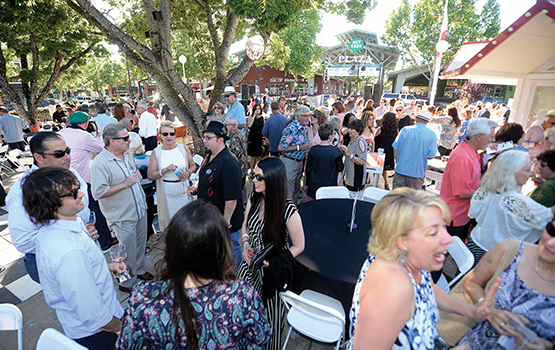 The Harbison Event Center at the Nut Tree came alive again for the 30th annual Solano Wine & Food Jubilee, held May 20 in Vacaville. More than 1,700 revelers enjoyed award-winning wines, foods and brews; danced to music provided by the Vino Banditos and the Time Bandits; enjoyed the camaraderie that comes with attending Solano County’s best-attended fundraising event; and learned who won a brand new car in the Jubilee Raffle—Ray Goodson of Vacaville. The last time the Nut Tree hosted a public gathering was in 2009, and volunteers worked hard to spruce up the site for the event, which took on a “Wine Country Stroll” theme. In its 30-year run, the Solano Wine & Food Jubilee has raised more than $5 million to support the programs of NorthBay Hospice & Bereavement. Presenting sponsors were Al and Patt Shaw; Freeman Family & Cosmetic Dentistry; DPR Construction; Vacaville Buick/GMC, Nissan, Dodge and Hyundai; Western Health Advantage; and Brett and Mimi Johnson. 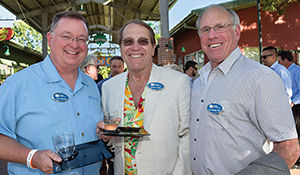 NorthBay Healthcare Foundation Board Members (from left), Chris Sweeney, Dennis Landis and Dr. Lee Freeman enjoying the Jubilee.